- Publisher DISCOVER YOUR HOLY CALLING. The Bible exhorts us to pursue a life of holiness. But what does that look like in everyday life? We struggle with our sinful nature within and with a morally polluted world around us. How do we live holy lives? In this companion study guide to The Pursuit of Holiness, you can discover the Bible's guidelines for holy living. 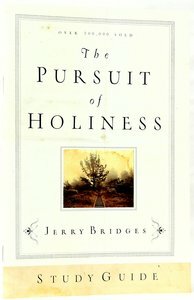 This guide includes 12 lessons in which you will carefully look at many of the same Scripture passages Jerry Bridges studied to glean the principles he presents in The Pursuit of Holiness . About "The Pursuit of Holiness (Study Guide)"
DISCOVER YOUR HOLY CALLING. The Bible exhorts us to pursue a life of holiness. But what does that look like in everyday life? We struggle with our sinful nature within and with a morally polluted world around us. How do we live holy lives? In this companion study guide to The Pursuit of Holiness, you can discover the Bible's guidelines for holy living. This guide includes 12 lessons in which you will carefully look at many of the same Scripture passages Jerry Bridges studied to glean the principles he presents in The Pursuit of Holiness . Jerry Bridges is one of the most widely recognized and trusted Christian writers today. The former vice-president for corporate affairs of The Navigators, he continues to serve as a Navigators staff member, ministering to college students, churches, and other groups around the world. His first book, The Pursuit of Holiness, is a modern classic with sales over one million copies. He is also the author of I Exalt You, O God, The Practice of Godliness, Trusting God, Transforming Grace, The Discipline of Grace (winner of the ECPA Gold Medallion award), and The Joy of Fearing God.